John Tory has a number of connections, municipal and federal which will make his job of expanding the airport that much easier. People who want a waterfront for everyone need to convince their councillors that the jet idea shouldn’t fly. John Tory seems to have created a powerful synergy in and around his office with the goal of bringing jets to the waterfront. Consider the parts that go to make up the whole. First and foremost is Porter Airlines. It is the airlines’ plans behind the Toronto Port Authority’s initiative to expand the airport to handle jets. It is Porter Airlines that hired Sussex Strategy, a lobbying firm well-known around city hall and especially to development oriented councillors. Porter Airlines now has some well-placed Sussex people right in the mayor’s office. Chris Eby, still on the Sussex roster according to his Linkedin page, is John Tory’s chief of staff. 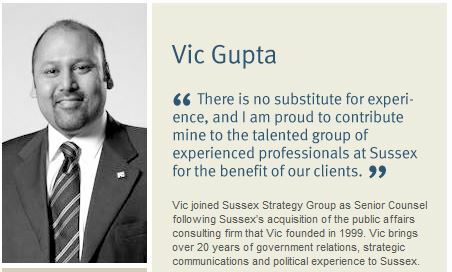 Another key player, Vic Gupta, John Tory’s principal secretary, is senior counsel at Sussex. Interestingly, Mr. Gupta was identified in the May 29, 2006 issue of the Hill Times as a federal lobbyist for the Toronto Port Authority (TPA). Of course, John Tory and his two staffers will argue that Sussex is no longer active on the airport file. It’s true. The city’s lobbyist search shows that Sussex closed their registration on November 27, 2014, the week before John Tory was sworn in. Did they perhaps feel their job was over? Sussex Strategy also has a connection to Deputy Mayor Denzil Minnan-Wong, a known expanded airport supporter. Sussex contributed to Mr. Minnan-Wong’s 2000 and 2006 election campaigns. A paper search at city hall shows, according to entry #23672, that Sussex Strategy Group Inc., 101 Yorkville Ave., Toronto, M5R 1C1 contributing $150 to Minnan-Wong’s campaign. Six years later, the electronic record shows Sussex up the ante to $750. It appears that Ninnan-Wong became more valuable to Sussex. John Tory, it would appear, has picked up at least one marker outside his office in the crop of new councillors. 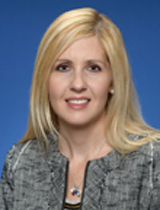 Christin Carmichael Greb, taking over from Karen Stintz in North Toronto, is an avowed airport expansionist. She was also a business analyst for Bombardier Aerospace, the outfit that is selling the CS100 jets slated to use the waterfront skies. The interesting thing about Ms Carmichael Greb’s candidacy is that John Tory and transport minister Lisa Raitt, slated to ok the runway extension, both endorsed her during the campaign. Does the word payback figure in to this at all? Transport minister Raitt, former CEO and president of the Toronto Port Authority, is the person who will approve the TPA`s expansion plans. Not only did she endorse Carmichael Greb`s candidacy, she also recommended people vote Tory for mayor. How often does a federal cabinet minister from Halton weigh in on a Toronto municipal election? Could she be wanting to wrap up unfinished business? The irony about the last election that seems lost in all the talk of subways and traffic gridlock is that looking at the line-up in John Tory’s entourage, the election was about future of the waterfront and it seems that those who would despoil it won. Even so, there is a way out for those who believe that this natural gift should be conserved for future or even improved with plans that don’t include jets. City hall staff members, the real heroes of this piece, have not succumbed to the enormous pressure put upon them by expansion proponents. Their steadfastness shows that they can be trusted to ensure the TPA’s environmental assessment meets the objectives set out by council on April 1, 2014. Supporters of a liveable waterfront have a vital role. We too can hold the TPA’s environmental feet to the fire to make sure the cumulative effect of jet activity and increased air and ground traffic are included in the study. More importantly, we need to muster all the political might we can. In the end, those councillors who would favour furthering their own careers and succumbing to inflated claims of short-term economic advantage over a sustainable waterfront need to hear from constituents who believe otherwise. It is an engaged public who will win the vote. 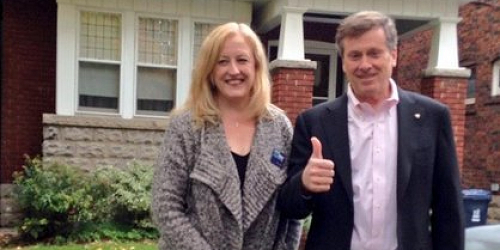 John Tory and Lisa Raitt – Thumbs up for an expanded airport? They, as well as the councillors need to hear how the waterfront needs to be saved for future generations, not to be subject to an even busier, noisier, more polluting airport.